This image was scanned from the publication - How Firm a Foundation: A History of the Township of Cramahe and the Village of Colborne in Cramahe's Digital Archives (3bk), p.41. 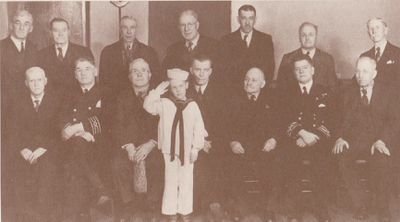 The caption reads: "Down to the lake in ships: (back, from left) George Kirk, Harry Redfearn, Grant Redfearn, F. McGlennon, Walter Terry, Philip Mathews, Walter Kirk, William Hoskin. In front are: Capt. Rooney, Chas. Redfearn, Capt. J. Peacock, Ralph Redfearn, unknown, Capt. Goddard, Gordon Terry. The little boy is thought to be Harry Redfearn."